Our snow coach driver and good friend, Tamarak, shared an interpretive theme about the park with us on our two-day journey into the interior – the tracks of Yellowstone. The traditional definition of track is a mark or succession of marks left by something that has passed. 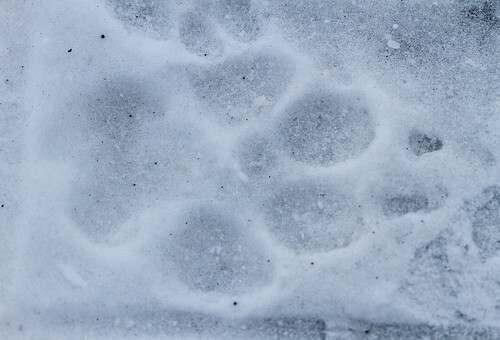 We all usually think of something like a footprint as a track – like the huge wolf tracks we saw on several occasions in the snow. But Tamarak talked about tracks in a more holistic way. 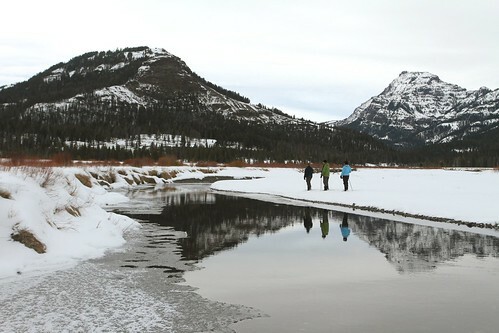 She said there were tracks – evidence of something that had passed – in every aspect of Yellowstone. The caldera, the crater left by the last volcanic explosion in Yellowstone over 640,000 years ago, is a track left by the activity of the magma chamber lying beneath the surface of the park. The track of the fires of 1988 are still visible in the thousands of dead standing trees and the thousands of acres of dense Lodgepole Pines that that were reseeded by those fires. The reintroduction of Gray Wolves in 1995 has left a track on not only the various prey species such as elk, and the larger carnivores such as grizzlies and eagles that use the wolf-killed carcasses, but on the vegetation grazed by the elk herds, and the smaller organisms that utilize those habitats that now appear to be rebounding. And the fact that there is a preserved area called Yellowstone is a track left by a society that valued the unique qualities of this place enough to set it aside for future generations. That single track led the way to the creation of a national park system that has left its mark around the globe as a model for the preservation of treasured landscapes. As the sun set on the way back to Mammoth, Tamarak asked us to consider another track – what a stay in Yellowstone had meant to us – what track Yellowstone leaves on our spirit. We talked about that as a group on our last morning in the park, after driving out toward Lamar. On that short drive, we experienced another beautiful morning in Yellowstone – temperatures hovering at 5 degrees F as clouds on the horizon were set on fire by a rising sun, elk feeding on high ridges above us, a lone coyote that turned to look back after crossing the road, and a herd of bison that escorted us slowly along a portion of road that they had claimed as their own before finally allowing us to pass. What track does any of this leave on your spirit? Our answers varied – a desire to simplify our lives, to live more in the moment; a wish to share the magic of this place with our students and loved ones; a deeper spiritual connection to our living planet; a calmness from our stressed out lives. For many reasons, this place called Yellowstone does leave a mark on our spirit and, for many, a trail that keeps leading us back for more. Said really well, thanks again Wolf, I mean Mike!